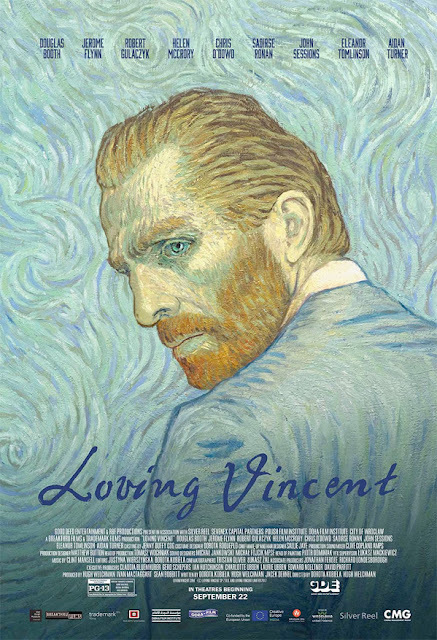 In producing the cinema art, Loving Vincent, every one of the 65,00 frames of the film is an oil-painting hand-painted by 123 professional oil painters who travelled from all across the world to the Loving Vicent Studios in Poland and Greece to be part of the production. As remarkable as Vincent’s brilliant paintings, is his passionate and ill-fated life, and mysterious death. Loving Vincent was first shot as a live action film with actors, and then hand-painted over frame-by-frame in oils. The final effect is an interaction of the performance of the actors playing the artist’s famous portraits, and the performance of the painting animators, bringing these characters into the medium of paint. Van Gogh’s paintings come in different shapes and sizes, so the design painters had to work out how to best show these paintings within the frame set by the cinema screen. This required breaking outside the frames of Van Gogh’s paintings, while still retaining the feel and inspiration of the artist’s originals. They also had to work out how to deal with ‘invasions’, where a character painted in one style, comes into another Van Gogh’s painting with different style. Moreover, for the purpose of the story, sometimes change daytime paintings into night time paintings, or paintings which were done in Autumn or Winter, had to be re-imagine for summer when the journey of the film takes place. The Character Design Painters specialized in re-imagining the actors as their famous portraits, so they would retain their own features and at the same time recognizably take on the look and feeling of their character in painting form. They were 377 paintings painted during the Design Painting process. The painting animators then use the reference footage, and paint over this with reference to the style (brushstrokes, colors, impasto) set by the Design Paintings to paint the first frame of their shot on canvas, sized 67 cm by 49 cm. Then they animate the shot by re-painting, matching the brushstrokes, color and impasto of their previous frame, for all parts of the shot that are moving. At the end, they are left with a painting of the last frame of the shot. Each frame is recorder with a Canon D20 digital stills camera at 6k resolution. So the audience will be seeing 65,000 high resolution photographs of actual paintings. Loving Vincent will mesmerize audiences this November, exclusively distributed by Solar Pictures.